This entry was posted in Nerdiness, Thoughts and tagged Amazon Market Place, App Store, Apple, Engadget, ILife, iOS, iTunes, mac app store, Mac OS X, Mac OS X Lion, Macintosh, Operating system by Justin Scott. Bookmark the permalink. @Dg01844 any theories as to why that is? Seems like it would be the first Apple app in the store for very obvious reasons. @JamesMRobertson It is but when there is a new version, it would provide a better experience than going to the web. @peyta but not app stores within the iOS app store, right? Violates Apple’s TOS. @justex07 do we have any Apple experts in our midst who can help us? iTunes is still supported for previous builds of Mac that do not have access to the app store (10.5) and also windows. I think at the moment it is just easier to keep distributing from a single location, rather than having an app store version and a direct download version. I could see it changing in the future though. @iryan Those are good points. I don’t suggest Apple abandon web distribution for Apple computers needing iTunes since anything before Snow Leopard doesn’t have a Mac App Store. But it seems to me that it would be smart for Apple to put the iTunes app, easily their most popular app, in the MAS with all the others. If they wanted to streamline the process later, then they could do so. But at least have it show up in a search for iTunes. 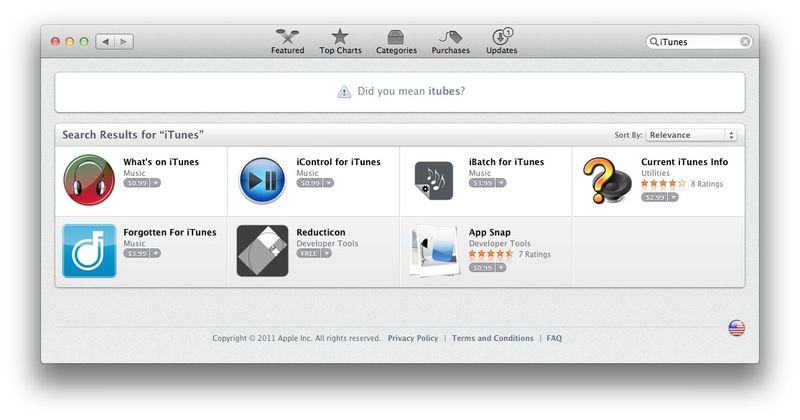 Do it now and it says “Did you mean ‘itubes'” which is hilarious! @Dg01844 @justex07 If iTunes was in the MAS, people wouldn’t update it as often. Plus, deploying it over Lion Server would be difficult. @Dg01844 @justex07 one place to update everything sounds like a plan to me. it would just be even simpler. @Dg01844 @justex07 Sounds good, but does MAS check for updates and download them in the background? Sadly, no. @Dg01844 @justex07 exactly, if they did, I’d love it. 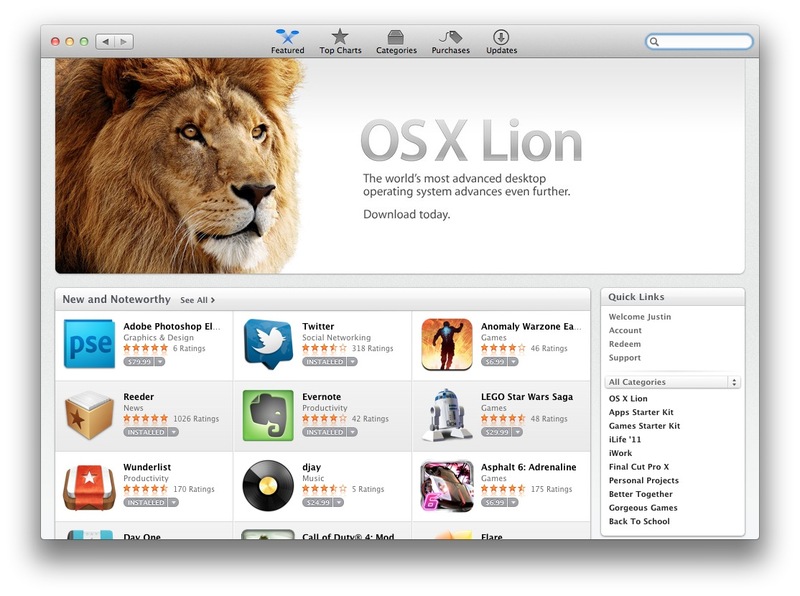 Also, it seems slow on Lion than Snow Leopard. @perrysalyer @Dg01844 I feel Software Update is going to be replaced with MAS Update since both feature software updates. @perrysalyer @Dg01844 at first everything was slower on Lion for me but things have sped up, since indexing has finished and things updated. @perrysalyer @Dg01844 however, I’m not used to my entire 8 GB of ram being used up, suppose it’s a good thing but startling at times! @justex07 @perrysalyer Apple must want the Lion transition to be several months to a year underway prior to that iteration. Data center FTW!